For Mary Marston has received several large pearls – one a year for the last six years – and now a mystery letter telling her she is a wronged woman. If she would seek justice she is to meet her unknown benefactor, bringing with her two companions. ‘For me,’ said Sherlock Holmes, ‘there still remains the cocaine-bottle.’ And he stretched his long white hand up for it. I’m making an effort to read every one of Conan Doyle’s Sherlock Holmes stories because (gasp) I haven’t yet. A Study in Scarlet is a strange miasma of events, traversing from foggy, gaslit London to the wild American west that disconnected me as a reader. 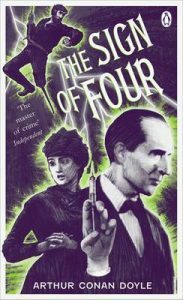 The Sign of Four reminded me much more of the traditional Sherlock Holmes story. 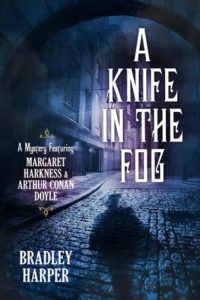 I do think Conan Doyle’s strength as a writer is the short story, but this novella is an engaging read through Victorian London. In The Sign of Four, Mary Morstan has received one large pearl a year for the last six years until she receives a mysterious letter revealing that she is a wronged woman. 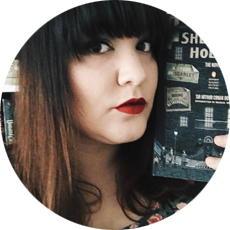 She visits Holmes and Watson to get to the root of the mystery. Watson falls in love with Morstan over the course of the narrative (nearly instantaneously, I might add), and Holmes finds the greatest pleasure in keeping his mind active, away from boredom. The blatant racism and misogyny (however authentic to the time in which it was written) is difficult to read in today’s times and that certainly takes away from some of the enjoyment of the story for me. However, the appeal of Sherlock Holmes still remains. Watson’s a sharp narrator who is consistently challenged by Holmes’s charming arrogance. With enough action to keep you glued to the page as the narrative propels itself forward, it’s always a pleasure to see how Doyle manages to bring it all together, however messily or neatly.